Hey folks...how's everyone's week going? 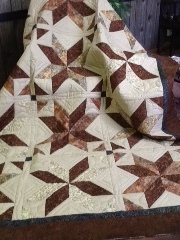 I am busy working away at quilts...still no real cleaning going on...oops! 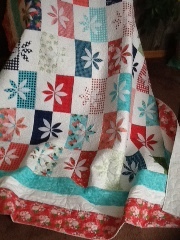 I love this quilt, large freehand daisies in borders, ruler work in the ditches, and stippling in blocks. Not a great pic, but I think you can get it. I have this one in being hand quilted now...started tonight. 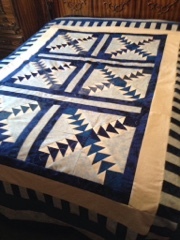 My hubby pieced this last winter for me...finally getting it quilted. 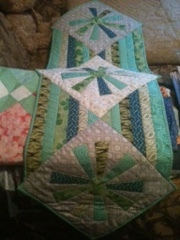 I am piecing an order too, but no pics yet. And I have two projects to do for blog hops...so, you better get to it! I LOVE the Wallflowers and the blue and white geese one. 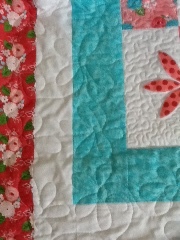 The quilting on Wallflowers looks so pretty. 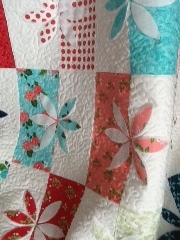 Your hand quilted piece looks so pretty too. You always keep so busy. Lots of pretty work going on at your house!